En español | Do you say “If only I were thinner I’d wear that” or “If I had the nerve I’d wear that” or — even worse — “If only I were 10 years younger I’d wear that”? Thought so! Fast fashion and runway trends are scary and often ridiculous for real lives, real bodies. But here’s what’s most important: Don’t get sucked back into “age-appropriate” rules or body shaming! Women 50-plus are age disrupters and we can rock anything on the rack with a little common sense and an adventurous attitude. Make my nine tips your mantra. 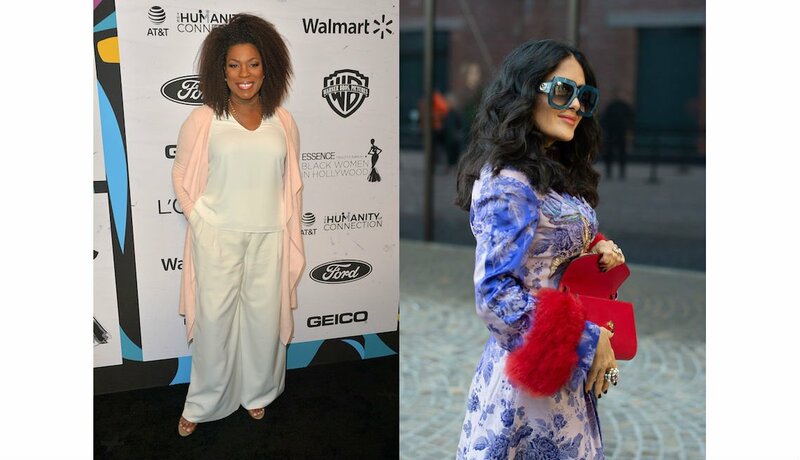 Lorraine Toussaint in wide white pants and white V-neck top with a long, flowing, pale pink cardigan and Salma Hayek in blue print coat with red fur cuffs, statement green glasses. Don’t let pounds and perception get in the way of your style choices. A little dress-slim trickery is great but a feel-good mind-set can and should override the scale or bulges when it comes to a passion for fashion. If you’ve been craving wide white pants, a clingy dress or a fitted coat in a wild print just indulge. 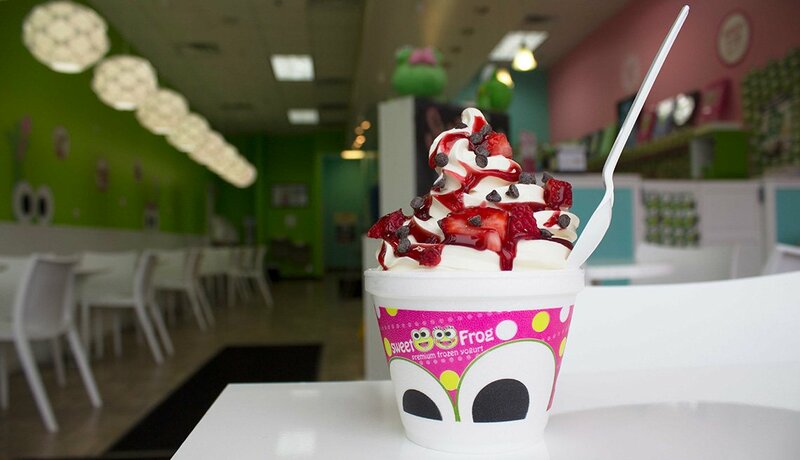 Consider it a calorie-free dessert. 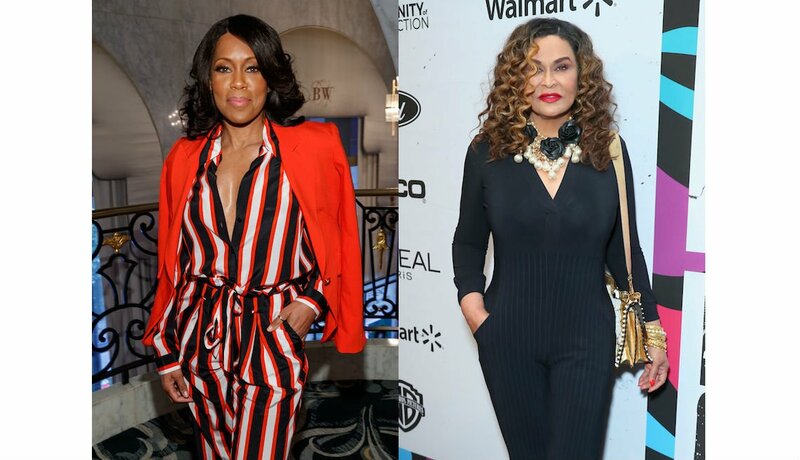 Loretta Devine in flowing V-neck dress with print belt and funnel sleeves, Sharon Stone in black sleeveless turtleneck jumpsuit and leopard print coat and Meryl Streep in asymmetric ruffled blue top and slim ankle pants. You know that grabs-your-gut feeling when you see sleeves to die for or fall in love with ruffles (and you’ve been avoiding them for 10 years like a bad ex)? Go for it! How an item makes you feel is more important than how it makes you look. Style often depends on one standout item in an outfit of ho-hum basics. Maybe it’s an asymmetric neckline sweater or a leopard print coat, or red bow-tie mules. If it speaks to you it’s meant to be. 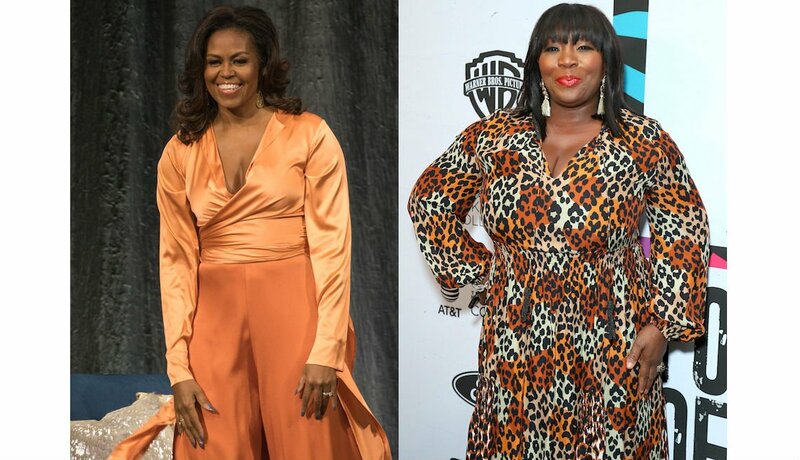 Michelle Obama in peach silk wrap blouse and wide-leg apricot pants and Bevy Smith in leopard wrap dress. Whether it be a semifitted silhouette like a leopard wrap dress or a wrap blouse and wide-leg pants, give your curves a hand. Try teaming a fitted top with a loose bottom piece or vice versa. Bare something you love — your legs, ankles, wrists, shoulders or neck and collarbones. Yes, your body is changing and your inner beauty is evolving so why shouldn’t your clothing be going through some transitions, too? 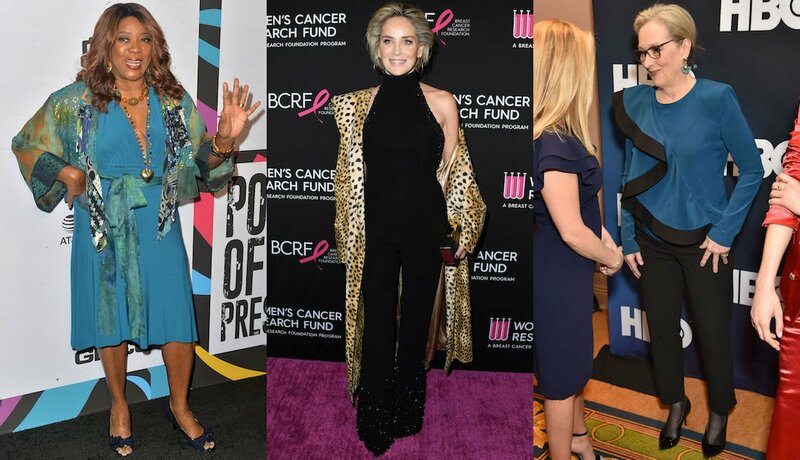 Christie Brinkley pairs a timeless turtleneck and red puffer with leather ankle-cropped pants; Valeria Bruni Tedeschi in mixed print blouse and skirt, and Tilda Swinton in yellow ruffled dress and baby blue classic heels. No need to binge on a head-to-toe look. In fact, shopping more slowly allows you to meld trendier pieces with your old standbys. This gradual approach gives you time to try new pairings — mixing two different prints (a color linking both helps) or pastel brights together for an instant pop! Maybe it’s as easy as adding of-the-moment leather pants and lace booties with a timeless turtleneck and puffer. Maria Bello in taupe jersey draped cape-dress with statement necklace/belt combo, and Octavia Spencer in clingy gray knit sheath and gray nipped-waist leather biker jacket. If you wear mostly black, tan and brown, sticking with your usual color palette helps you test new-for-you silhouettes such as wider pants, midi skirts and asymmetric necklines with very little risk. 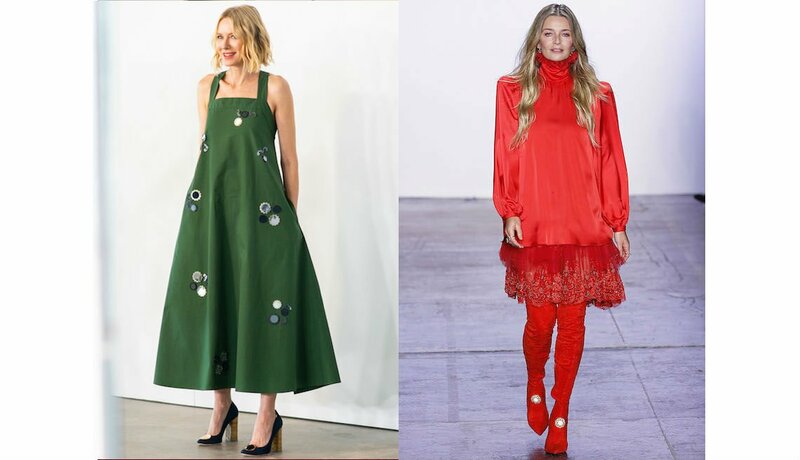 Naomi Watts in green A-line loose midi dress and supermodel Paulina Porizkova in designer Jiri Kalfar — red head to toe. We get so used to our regular shopping destinations that we often never look anywhere else. While big-name fast fashion and mass retailers have made trendy at any size easier (and we’re talking sizes 0 to 30 here, XS to 3X), new sites are fun to check out (just like celebs trying a new designer for the red carpet). Have you looked into Asos, Zara and H&M? I’m sure you have peeked! But what about the hot new plus-size brands like ModCloth, Eloquii, Good American (amazing jeans! ), Premme, Torrid, Jibri and Zelie for She? 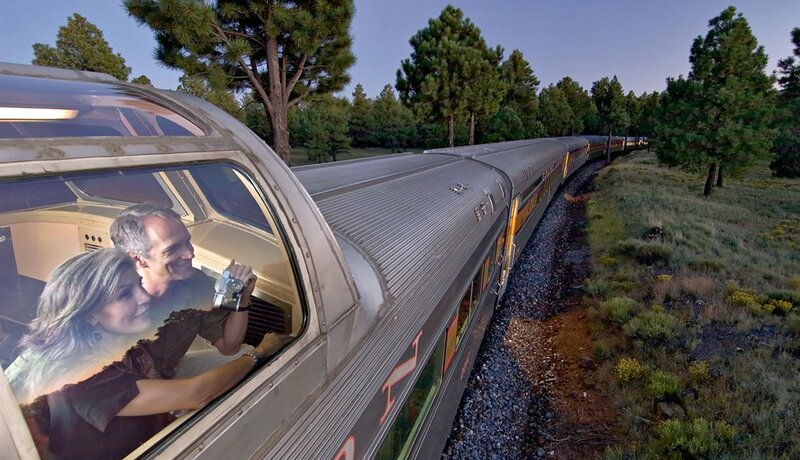 Take a chance — what’s the worst that can happen? Return! Your new fashionable fling doesn’t have to “match” your typical style or the clothes you own. Even the most classic or basic wardrobes can always use surprise. Make flowing pants and a tunic a statement with contrasting colors, or instead of an LBD choose a dress in pink lace. 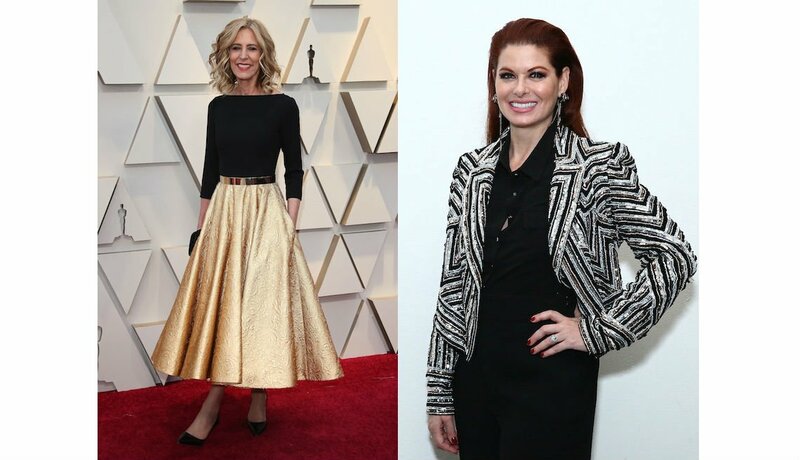 Christine Lahti in gold A-line midi skirt and black top and Debra Messing in cropped sequin jacket over a black blouse and pants. We all have enough little black dresses and still serviceable black “evening” pants. Adding in one new item that shines or shimmers updates all and gives your wardrobe a thrill. Sequins and metallics are now night-and-day OK! 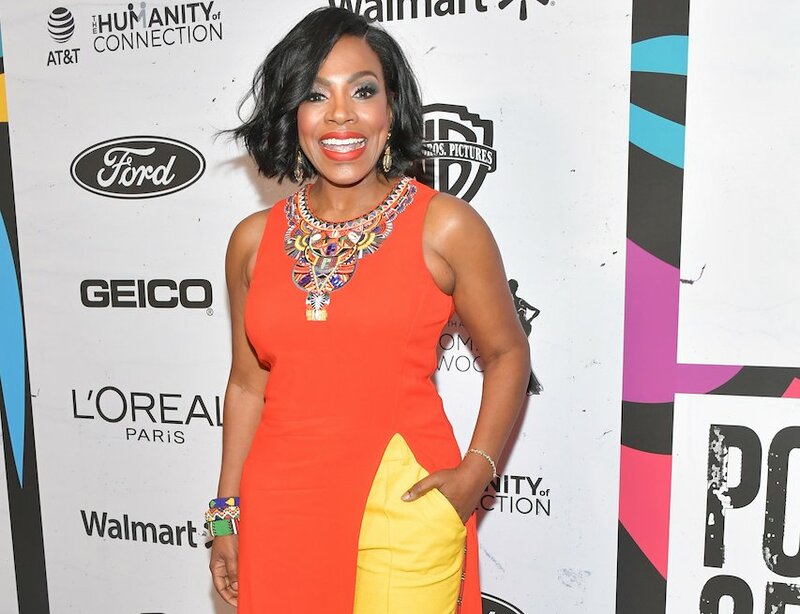 Regina King in striped red, black and white belt-tie, shirt-collar jumpsuit with over-the-shoulders red blazer, and Tina Knowles Lawson in black knit V-neck jumpsuit, a major statement necklace and metallic shoulder bag. Yes, black pants and a black top are easy pickings but wouldn’t a jumpsuit be more fun? And how about mixing it up more: Toughen your feminine classic pieces with leather, in jackets, skirts or pants. Add a hit ’em over the head statement necklace and a metallic bag for instant glamour. Last word: Hit the dressing room prepared for change. Take along some Spanx, heels and flats, and wear your best bra and something that makes the whole try-on experience easier. You do not want to be struggling to pull off tight jeans or to wear leggings when looking for tuck-in tops for work.